Tassels, tassels, everywhere tassels. Is it me, or is everyone on the planet wearing tassel jewelry right now? No, it's not me. Every fashion blogger IS wearing a tassel necklace right now. Well I wanted to join in on the tassel fun too! But only one problem, I didn't have a tassel necklace nor have I seen any in the stores in my neck of the woods. We tend to get the trends in our stores a little late around here. Isn't it pretty? I'm so proud of myself for I only spent….drum roll please….$4.00 to make this tassel necklace. Being a lifetime sewer, I already had the tassels, and I use fishing string in the garden all the time so I had that too. I've also done a little beading thus I had an assortment of beads lying around, but I didn't have enough of one bead to make such a long necklace. I went to Michaels and Hancock Fabrics and their beads were so ridiculously expensive that I then broke my personal anti-shopping-Walmart boycott and found some inexpensive beads there. 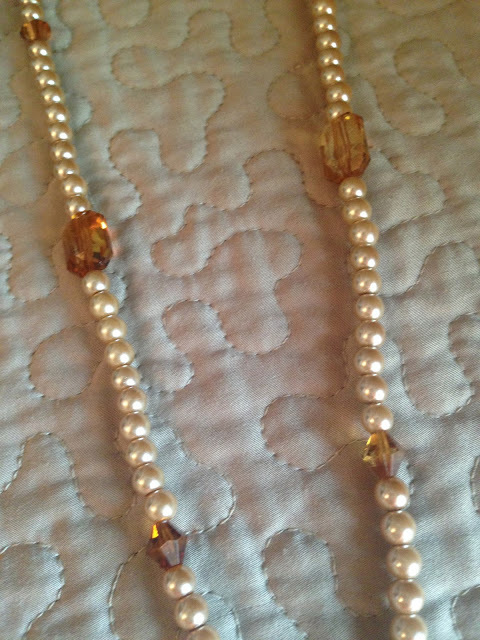 I paid $1.00 a piece for two strands of pearls, and $2.00 for a small package of the clear brown beads. The main bead next to the tassel was already in my stash. 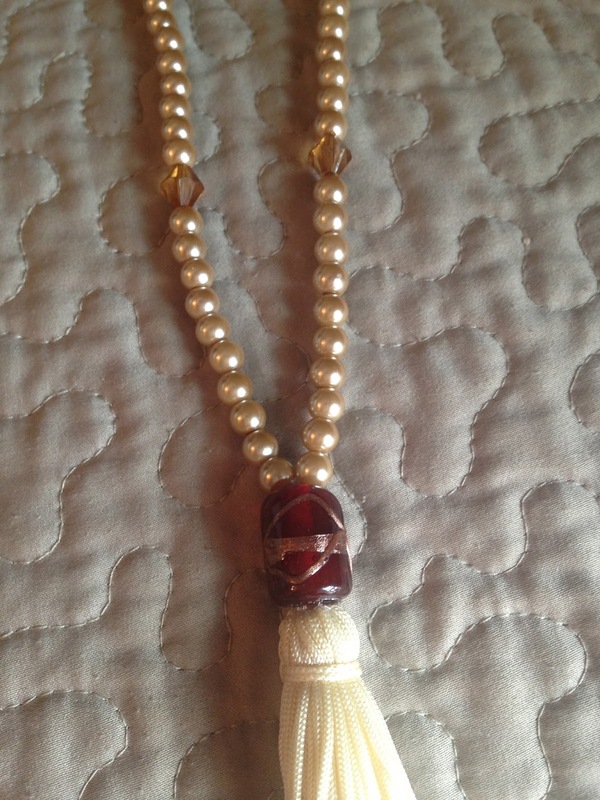 Because my tassel was a cream color, I went with cream colored pearls and clear brown accent beads. Now, I didn't have any problems making my necklace….just a few little setbacks. When I read Chloe's instructions she said if your tassel comes with a tie to remove it. But there were no instructions on how to remove it, so I just carefully cut it and the tassel fell apart. Thankfully, I had another tassel, so I tried it again but this time I didn't remove the tie. You can't see it in the picture, but I left the tie on and just tucked it behind the tassel. I then followed all the rest of Chloe's instructions, and everything else went very smoothly except I didn't cut my fishing string long enough so I had very little to tie with, and guess what? I dropped the necklace and all the beads fell on the floor and I had to start all over! (Chloe did warn that might happen. How did she know? :) I was beginning to wonder if I should have just spent the $50.00 on the necklace after these two mishaps. However, after I picked up all my beads and strung them back together, I had no more mishaps and I ended up with quite a pretty necklace if I do say so myself. When I tried the necklace on, I didn't like how the tassel was laying underneath the main bead, so I put just a touch of FabricTac Glue on the top of the tassel and pressed it against the bead and held it for a few minutes till it dried; and wa-la! It laid perfectly, exactly how I wanted it. I even wore the necklace for a full day to make sure it remained intact and laying properly, and it did. The glue was a lifesaver. The reddish brown bead right above the tassel in the top picture was already in my stash. All the other beads I purchased at Walmart. I have since discovered that you can buy beads ridiculously cheap on Ebay or Etsy, so if you want to try making your own tassel necklace, I would suggest trying those sites before hitting an arts and crafts store. Tassels can also be very pricey. You can find those at any fabric or drapery store, but Chloe also recommends Etsy for purchasing those as well. Since making my own tassel necklace, I have seen so many more in blog land that I like that I might make some more. Here are some of my personal favorites. These ladies are wearing store-bought tassels and some of them have links to where they bought their tassel necklace if you'd rather buy one and not make one. I love how Carly has matching tassel earrings to go with her tassel necklace! 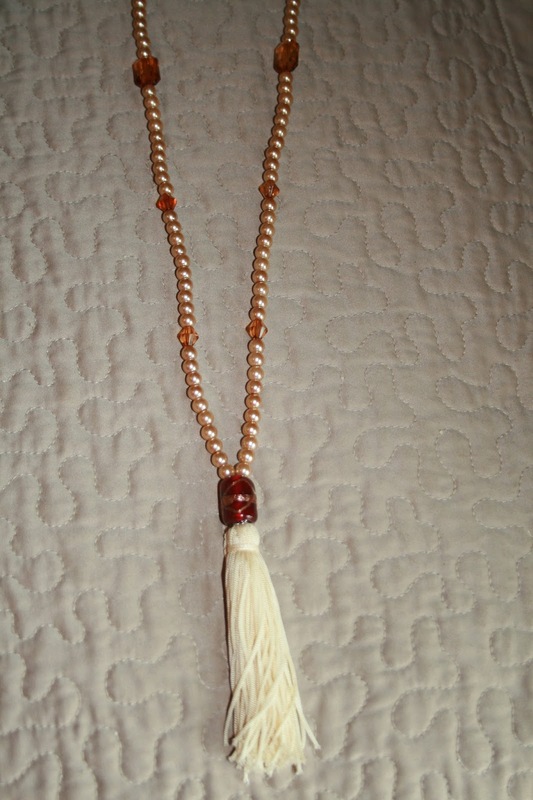 Janice's tassel is made of gorgeous pearls! I love the color and length of this necklace from Nordstrom's that Kendi is wearing. Gorgeous! But would you believe they want $52.00 for it? Not in my budget! And my favorite one of all is by Beaded by W and is showcased on Jessica's blog. I absolutely love the color and length of the tassel! But again, it's $48.00 and out of my budget. I will be keeping my eyes open for a big, bright tassel like this because I'd love to make one that looks like this! And just in case you were thinking tassel necklaces are just for the young un's, here is Susan wearing a large, tassel necklace with bigger beads. Love it! And finally, I love how the ombre effect the beads have in Casey's necklace. This would be a great one to make if you didn't have a lot of the same exact bead. Well, have I convinced you to try making a tassel necklace of your own, or are you going to hit the websites and shell out the $50.00 bucks for one? I'd love to hear what you decide! And if you make one, I'd love to see yours! 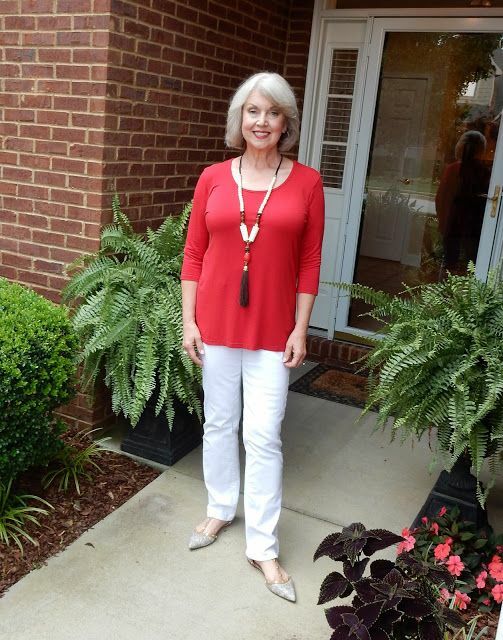 Loved this post, Amy, and you did a GREAT job on your necklace!! I love it!! I bought one earlier this season from Etsy, but it wasn't $50. Whew! I enjoyed seeing your new creation and it is very lovely and classy. I think this particular necklace you made will never go out of style. I have a few tassel necklaces but not beaded ones so I may have to try this. What a great tutorial! 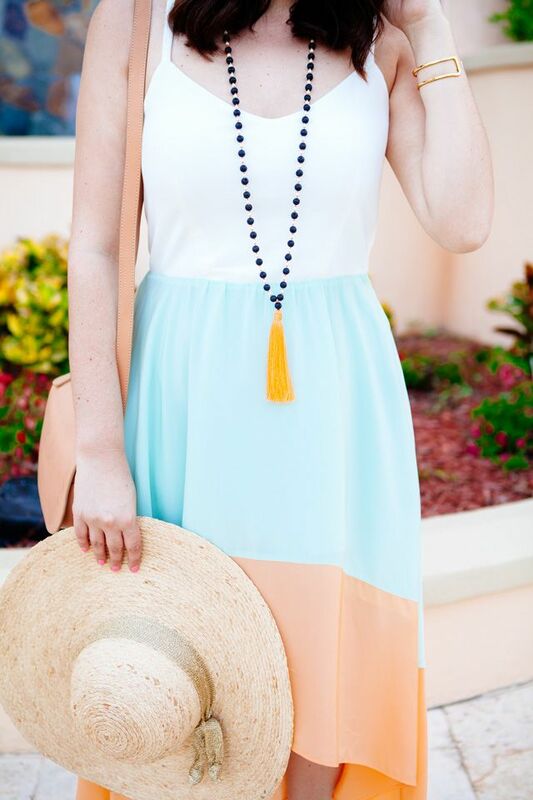 I love all of the tassel necklaces I've been seeing lately! LOVE this post! I actually just did a DIY tassel necklace, too and mine looks a lot different from yours (there are just so my varieties and color choices!). I can't wait to share it. Yours turned out great and yes I love that tutorial from Boxwood Avenue! Your necklace turned out great! I really want a tassel necklace too and need to consider making my own! Thanks for the inspiration! Now isn't that just a lovely necklace (and it looks so nice with your blouse)! Hmmm...I do believe I have some tassels in my stash, I just might have to dig them out! Thanks for linking up to Top of the World Style. Great tassle necklaces. You made me want to make my own. I guess that's the indent: Inspiring others. Tassel necklaces are really so popular right now. They seem easy enough to make but I am just too lazy - you did a great job! Wow, THANK YOU so so very much for sharing a link to my blog with this project!! I should add to leave the extra fishing string at the end to tie. Also, sad you dropped it when you got to the end, but happy it only happened once (happened twice for me ugh!). Thanks for giving your critiques as well! Means the world to me for your support. Hugs!